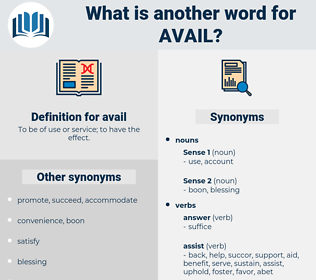 What is another word for avail? To be of use or service; to have the effect. needless, success, advantage, usefulness, leverage, outcome, outcomes, benefit, feasibility, result, results, achievement. exploited, Benefited, Appealed, Relied, Resorted, used. invoke, Invoking, seize, leverage, capitalize, prevail, receive, benefit, reap, draw, take, appeal, used. injury, ruin, destruction, disadvantage, loss, detriment, worthlessness, waste. She protested, but without avail. Of what avail against this was violence, the opening of letters and secret investigations? affably, abulia, apple, awfully, above all, affable, appeal, abel, afl, apollo, appall, abelia, abyla, apply, avowal, awful, appal, apulia, aboulia, ably, able, abila, abele, afoul. 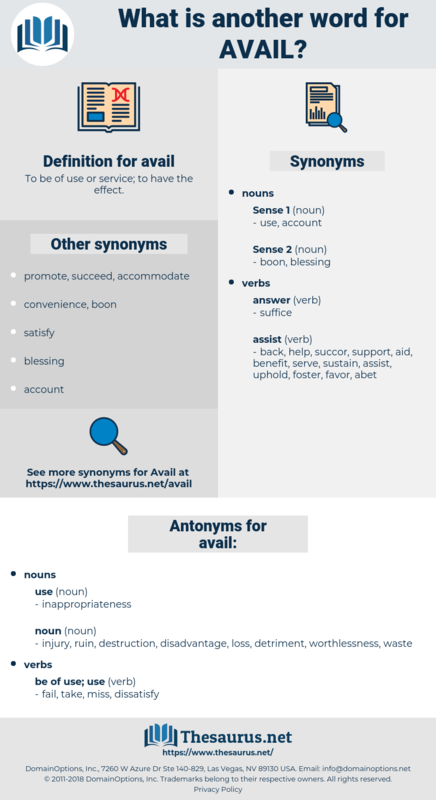 use, utilise, exploit, employ, apply, utilize, work.